It's been more than 31/2 years since the meltdown at the Fukushima Daiichi power plant, the worst nuclear catastrophe since Chernobyl. The incident made a profound impression upon New York-based dancer Eiko Otake, who this year made several trips to the abandoned disaster zone with photographer William Johnston. They shot a sequence of haunting photographs of Otake wreathed in overgrown weeds, bowed beneath wreckage, and standing, looking lost, on a derelict train platform. "I'm not a pessimist, but we have to recognize this very deep sense of despair," says Otake, 52. "When you are there in Fukushima, there is a very deep sense of failure. This notion that history is always progress is false." An exhibition of these photographs - "A Body in Fukushima" - are hanging (until April 5) in the Maguire Gallery of the Pennsylvania Academy of the Fine Arts' Samuel M.V. Hamilton Building. 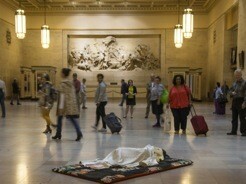 Otake will be accompanying that work with a series of performance pieces - "A Body in a Station" - at 30th Street Station this month. It is an attempt to contrast the bustling train station with its deserted counterpart in Fukushima, although most Philly commuters will have no idea what the elaborately dressed, downcast woman is doing in their midst. 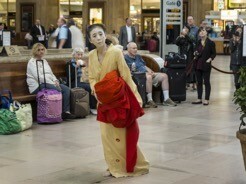 Although Otake usually performs with her partner, Koma, she didn't think the station lent itself to a "theatrical show." "Two people is a drama," she says. 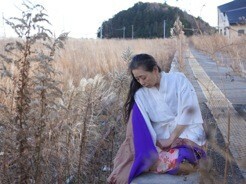 Each performance begins with Otake entering the station from the street, dressed in delicate yellow robes. Over the course of the three hours she lies prostrate on benches and on a red blanket on the floor. The periods of inaction are broken up by Otake's slow and intentional movements around the station. Commuter reaction to a late September rehearsal ranged from curiosity to studied nonchalance. Many people simply snapped photos of her on their smartphones without breaking stride. The effect is quite eerie. Otake's wraithlike presence serves as a reminder of the fragility of our built environment, of our civilization. The lulling routines of everyday life, like commuting, obscure the easily disrupted infrastructure that keeps everything in motion. It is easier not to think about what is keeping the trains running. But Otake's performance serves as a reminder that our energy sources are not without consequence.